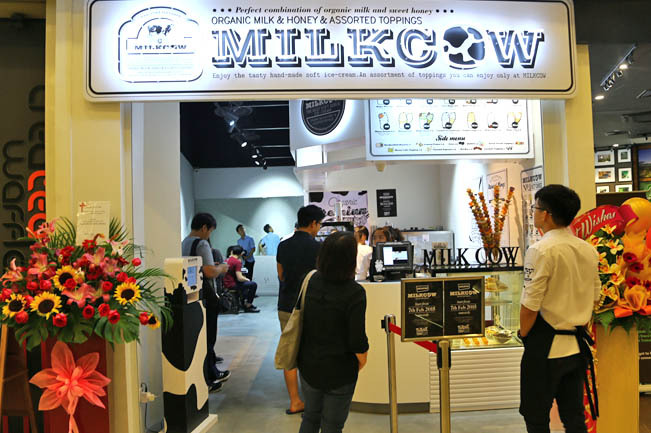 Did Milkcow come to Singapore half a year too late? I wonder. Taiwanese brand Honey Creme and Spanish frozen yogurt Llao Llao had already caused snaking queues at one point in time. 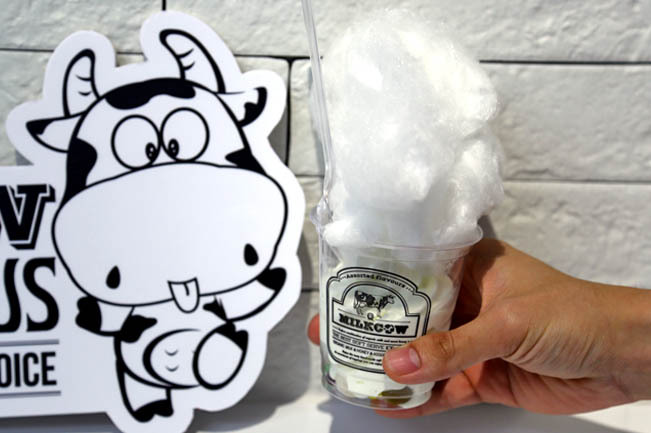 In South Korea, the soft serve craze all started from Softree and Milkcow. As what I earlier anticipated, the queue wasn’t long, perhaps with 3-4 persons waiting at any one time. 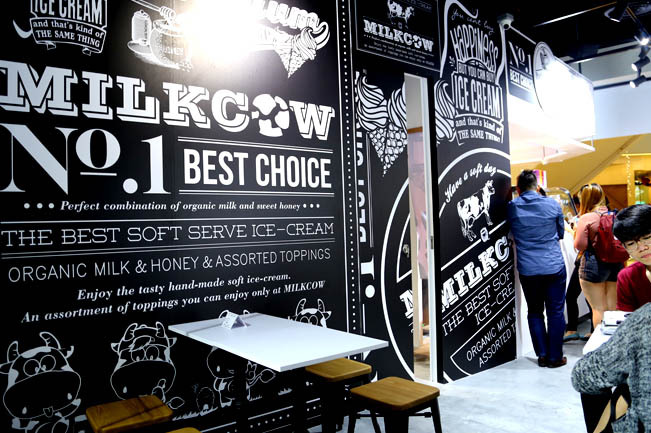 If Milkcow had been in Singapore earlier, the situation could have been a little different. The soft serve ice cream shop did take a while to set foot here, considering there are already outlets in South Korea, Japan, Hong Kong, and Malaysia. 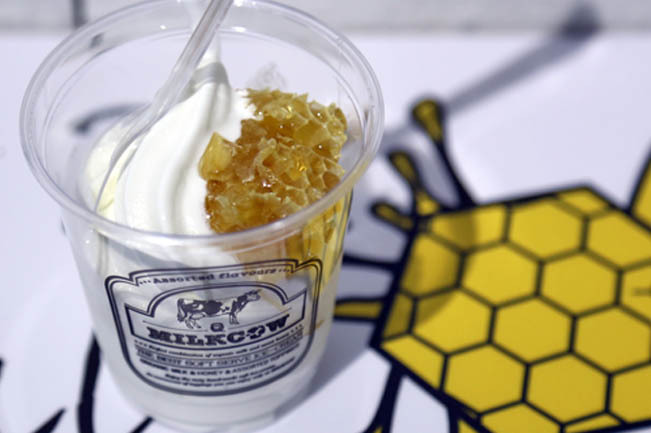 Milkcow’s signature soft serve is made with 100% organic milk sourced from Italian dairy farms, topped with ingredients such as organic honeycomb, nuts, Oreo crumbles, snow drop cotton candy with jelly beans, and Affogato. Sounds pretty much the same as its competitors. The verdict? Let’s start with the outward appearances first. Perhaps it was first day jitters; we noticed the portions of all our four cups were generally small, three quarters filled, and inconsistent. One cup had more soft serve than the rest. The soft serve were unfortunately not photogenic, suffering from a case of uneven twirls and flat tips, except for the cotton candy topped Snow Drop ($5.90). 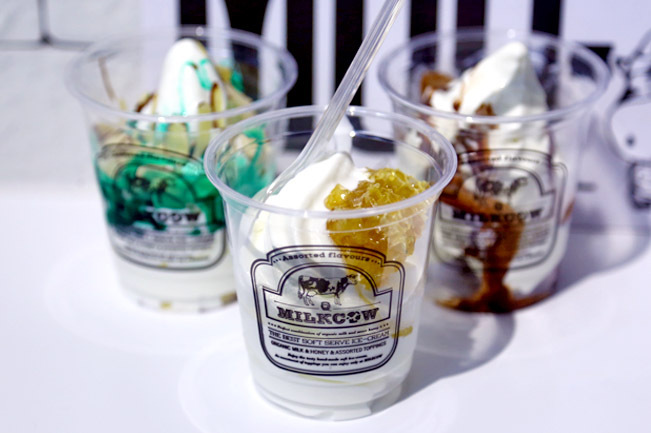 Taste wise (sorry to Honey Creme), Milkcow won in terms of smoothness, milkiness and taste which was not overly sweet. The Organic Natural Honey Comb ($5.90) also tasted marginally better than its competitors. We liked the Gianduia chocolate drizzled Black Pearl ($5.90) best, due to the addition of organic salt which gave every bite a varied and excitable sweet-salty tang. The photogenic Snow Drop ($5.90) was all good, until the bottom, marred by horribly tasting jelly beans. And I generally don’t quite mind jelly beans. While Honey Creme had a PR company handling its marketing, leading to a successful launch, Milkcow had Groupon. But that’s a sure-fire way to get lines, considering there were already close to 7000 groupons sold the last I check. That’s like 14000 cups sold even BEFORE opening. 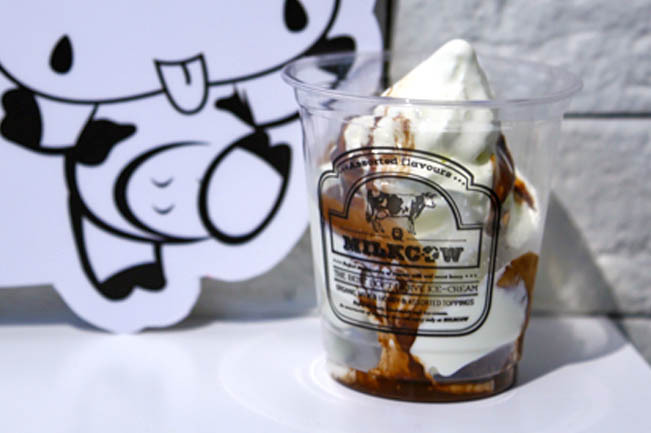 Milkcow has fared better taste-wise, but young social-media savvy customers do eat with their eyes. Also, Singapore may also be saturated with many soft serve shops, many of which though not as good in taste, are still quite comparable. I think many people will feel the same way, esp when the fastfood restaurant sells it at least 4-5 times cheaper. I had tried Milkcow & Softree in Seoul. Softree is better to me. Milkcow’s softserve pales in comparison. But with the Groupon offer, it’s attractive. Hope Softree comes to Singapore soon! 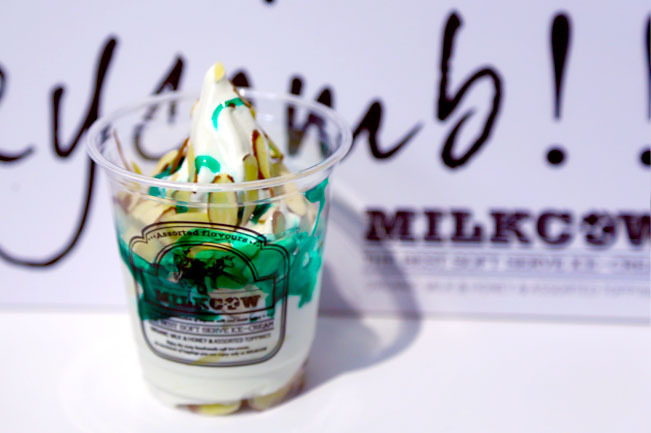 I have been waiting for Milkcow to come to Singapore for a long time, can’t wait to try them. They are one of the best Korean fast food brands out there, along with Jaws Tteokbokki and Isaac Toast (neither of which have a presence in SG – YET). I am a little concerned for them that they serve the same kind of products visually as Honey Creme, yet Honey Creme arrived first… Will people think Milkcow is just a copycat? Some may think so. Actually, whoever who reaches first, always has that additional advantage. Does milkcow have sugar? How many grams?